All organizations in the world running a business will always need human resource post to develop, market and promote their product. Recruiting people is a usual process which happens once in trimester or any time when a vacancy arises for a job role. Generally, most often people consider a recruiter and a human resource professional are of the same job role. But in reality, a recruiter is someone who works under the human resource team. There are also cases where recruiters are not permanent employees but are hired by human resource department to recruit people. 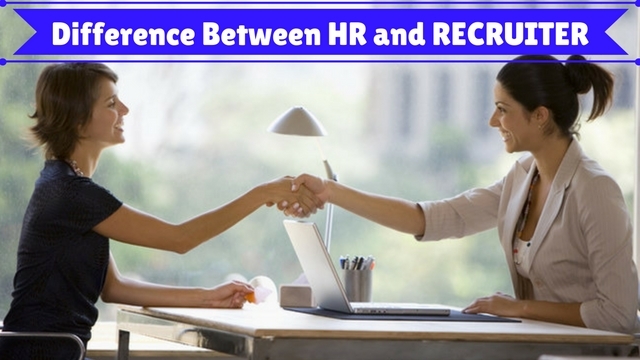 Read this post to know the difference between HR and recruiter. Once after the job role is been decided or when a vacancy arises, an HR department would be notified about it from the management. They are the people who receive the job role description from the manager or a team lead. Hence, the recruiter is no way related to creating a job role. They are been assigned by the HR to fill up the vacancy once the vacancy arises. There is a lot of work which is been done to inform the job seekers about the vacancies arised in the organization. Right from social media communications to newspaper advertisements, a recruiter is someone for the maximum reach of the news to the market. Once after receiving the exact data from the HR department, recruiters get involved in publishing the news to the market. Hence, recruiters will take care of media communication about the vacancy in the organization. Once after receiving the job vacancy information from the HR, recruiters work towards the entire interview process, like getting an employee from the team to take care of the technical part to also allocating human resource professionals for the interview process. The potential of the candidate is tested by the talent recruitment team to take them to the next stage of recruitment policy or to the hiring process. Whereas, HR department does only allocate the recruiter with the recruitment information about the need for the job role. Even though employment recruiters are responsible for the entire recruitment selection process from filtering of resume to the final personal interview, the next level of the process is done by the HR department. Like from discussing pay scale to appraisals, any kind of job queries are handled by the HR team. Before directly getting into the job role there are various levels of training and development that have to be undergone by the job candidate. Human resource department is entirely responsible for training the employee right from the scratch to till they become ready to the direct work in the organization. Recruiter’s job are sometimes even found as a part-time profession in few organizations. This is because sometimes job recruitment happens only in a trimester or even sometimes only when a vacancy arises. So, either they are employed as part-time professionals or hired as external employees. Whereas Human resources department takes care of hiring a recruiter as well as allocates tasks to the recruitment team. Once after a job seeker gets the job, the role of a recruiter certainly ends there and remaining part of training and development, appraisals, team allocation and also induction is conducted by human resource department. Hence, in short, a HR is someone who takes care of the overall wellness of an employee until he quits the job whereas, a recruiter’s job is limited to the recruitment. There is one more step of a recruiter either before appointing the job seeker or after the entire recruitment and selection process i.e the document verification. Even though this might look simple, it is the most important part of the recruitment. Educating the clients about the organization, describing the job role to the candidate are also some of the important activities played by the recruiter. Whereas, an HR will mostly wait for the final profile of the candidate instead of getting involved in the entire hr selection process of recruitment methods to choose the right candidate suitable for the job field. Before the recruitment procedure begins there would be a lot of application sorting done in the company. This can be either manually or automated. Recruiters take care of the entire database sorting of the candidate either manually from the applications or they maintain the application tracking system which is automated. On the basis of the database created by the HR department of any organization, a recruiter team goes on with their assigned task, i.e. recruiting employees or candidates among those selected from the piles of applicants. Taking individual interview in itself is a painstaking task that an HR normally avoids and assigns that job on recruiters to do. Recruitment team mostly comes under the human resource department. The pay scale of the recruiter is fixed by the management and their job role comes under the human resource department. Even though recruitment team works separately they are mostly designated job by the human resource department. For those who are seeking for a job prospect in HR process, it won’t be easy enough to bag a good post in HR post or gaining practical experience in enlistment. Both the profession i.e. an HR and a recruiter go out of their way to offer quick paced workplaces with open doors for progression and gain experience. So it fundamentally comes down to an individual inclination towards their job post. Individuals who would gladly go managing and sort out newer talent for the office jobs will probably incline towards being a recruiter part while HR experts who exceed expectations in the meeting procedure may discover more satisfied being in HR department than being a recruiter. It all depends on individual interest after all. The recruiter post is created for choosing and sorting out the right candidates for individual departments of the organization or the industry. He/she uses various mediums and goes through thousands of paperwork each day to sort out the right man for the vacancies. They are specialized people who know whom they ought to recruit and who deserve to be ignored in hiring process. They have a keen eye for small details while going through individual CV, portfolios, Biodata or resume. That is why they are chosen to guide deserving people into the organization. At the same time, HR generalists are multi-tasking people who often go through recruiting coordinator duties as well as responsible for other human resources duties that include dealing with newly recruits, training them and keeping up with organization’s public relation. Usually, an HR recruiter or generalist performs an overall job of its department rather than centralizing its gaze on any specific field or area of interest and expertise, HR handle all the actions that the department requires, with ease while at the same time the recruiters need to focus only on the recruiting process. Usually, if the workstation has a special department of recruiters, then they are in charge of duties of visiting institutions during the campus placement. Recruiters are the people who actually sit in front of you during your campus job interview while questioning you from your required academics field as well as according to their needs. At the same time, the HR may or may not have the privilege of visiting campuses during the placements. Even during the mass process of recruitment, the team of recruiters is given the charges, since HR may be given more important duties to perform. Recruiters are solely responsible for the recruiting new employee. They are certainly not in charge of training, coordination or managing them. That is the job of the HR generalist. In brief, the HR is responsible for the training of new recruits or trainee, making sure they do everything as instructed, properly coordinating and ensuring timely completion of tasks. HR can do the recruiting tasks when there is no recruiting team in an organization. As a matter of fact, the importance level of both the job field varies from organization to organization. A smaller organization that does not require frequent recruiting gets the recruiting job done by the HR generalists. But if the organization is a beast and recruits too often, then a special team of recruiters is designed to carry out the particular task. These organizations sometimes conduct mass recruitment when a new plant or expansion is going to be done. Those plant or extension would require new and more number of staff working and managing their expansion. So a team of specialized professionals called recruiters is made to sit for the process of hiring. Every post or field of the job has its unique set of qualification termed down to follow or to grab the job. For example, for HR posts you need a minimum a bachelor’s degree and sound experience in Human Resource management as well to get a good job in this department. But to become a recruiter you need to have more experience and human psychological knowledge than any book knowledge. As a professional recruiter, you should possess keen eyes to spot unique resumes and portfolios; easily get to understand the employee’s personality by his facial expressions and hand movements. A lot of experience is required in case of a recruiter than an HR generalist. Human resource is the capacity inside an organization that deals with the arrangements and duties related to staff and address their issues. It begins with looking keenly into individual resumes, making business offers for various departments and sectors as well as preparing your workforce documents regarding issues related to individual personnel like profession, vocation improvement, compensation expands, directing, terminating employment, retirement process, employment surveys like which departments lacks good employees and unemployment claims. Human resource is solely responsible for covering every aspect related to recruiting and managing staffs and thinking about their welfare. At the same time, recruiter is responsible solely for taking down interviews, choosing proper candidates and making sure the candidate was chosen is fit enough to adopt themselves with the changing workstations. Their importance is limited while the human resource is diversified. Hiring an employee is never an easy task for the organization as determines the entire success of the organization. Both recruiters and the human resource team are equally important for the organization as they are the two separate teams who are entirely responsible for the outcomes of an employee. Even though this job does not require any technical knowledge they are even more pressurized on tasks like hiring within given time, quality of the employee also to work within the cost allocation for the recruitment. Hence, even though there are certain differences between an HR and recruiter both the job roles or the entire team is equally important for the organization. Hope this post helps you understand better about the differences between an HR and the recruitment team.